Students begin their work on the BQX Project. 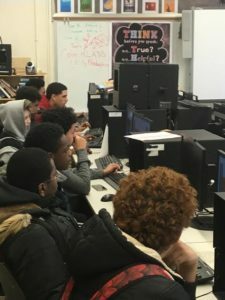 The Architecture Club at WHSAD is going to be working with the BQX Project, which is a plan within New York City to build a light-rail system connecting Brooklyn and Queens. 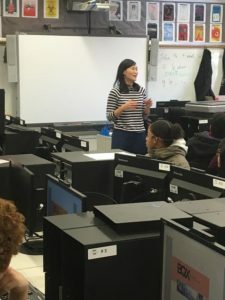 To Begin, Ya-Ting Liu visited the school and introduced the students in the architecture club to the BQX Project and explained what their role will be. The students are going to be split into two teams, Design and Site Analysis. The Design team is led by WHSAD junior Zeal Patel, who has experience in this area, and they will focus on the design of a station that is planned to be located in the Williamsburg/Greenpoint neighborhoods. The Site Analysis team is led by WHSAD sophomore Lawrence Goodridge, and their focus will be on-site parking and construction of a station in the Williamsburg/Greenpoint neighborhoods. The BQX Project is also selecting two summer interns to continue working with professionals on this project. To learn more about the BQX Project click here. Ya-Ting Lui talks to the students about the work they will be doing on the BQX Project.